Are you looking for an animal doorstop? 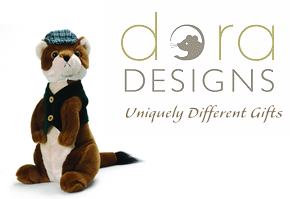 Dora Designs Limited are specialised in home accessories and gifts mainly based on animal characters. Their different and original collection of animal doorstops made from high quality fabric, gives you the chance to get a unique and stylish door stop for your house with a matching draught excluder. You can visit their website to browse their latest products but you will only be able to buy one of their uniquely different doorstops by visiting their official stockists. You can purchase with confidence with Stylishlife, one of their official UK stockists. The Stylishlife website contains an extensive dora design doorstop collection including the popular Bertie Hedgehog, Hazelnut brown Squirrel, the Angus Highland-Cow Doorstop and many more! Click here to browse their range of doorstops and to discover the Dora Designs 2011 collection called Pets Corner featuring a range of lovable pet doorstops in plush soft fabrics. The Rigby Rabbit and the Guinea pig doorstops are amongst our favourites!